KeePass and KeePassX look very close. You probably already know, but both KeePass and KeePassX (& now KeePassXC, a fork of KeePassX) are open source (published under the GNU General Purpose Licence 2) secure (using AES or Twofish) data storage programs, using a single database file to store (mainly) passwords, or pretty much any data you'd like e.g. user names, passwords, urls, attachments and comments. KeePassX is an "Contributed/Unofficial KeePass Port" of KeePass that was started in 2005 (if the copyright notice on the bottom of their webpages is accurate) to run KeePass on Linux. It is now available as a native program for Linux, Windows, OS X, and others. Originally KeePassX was called KeePass/L for Linux since it was a port of Windows password manager Keepass Password Safe. 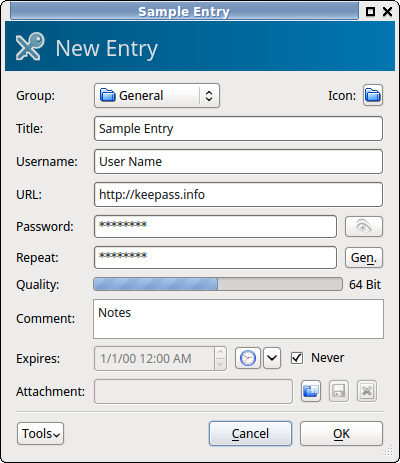 After KeePass/L became a cross platform application the name was not appropriate anymore and therefore, on 22 March 2006 it has been changed [to KeePassX]. KeePassXC seems to have been forked from KeePassX because of the slow development of KeePassX (it's last update was v2.0.2 on 2016-02-02) while KeePassXC started with v2.1.0 on 2017-01-22. Currently, the biggest difference between KeePass & KeePassX seems to be the appearance and "feel" of each program, especially on Linux or Mac OS X where KeePassX doesn't rely on Mono, so matches the look of other native programs closer. And, KeePassX's version 0.4.x & 2.x display issues. Also, KeePassX/XC doesn't support plugins (there are several plugins for KeePass), as the user Grief points out in their answer so do upvote it too. In Ubuntu 16.04 LTS & 16.10, using the KeePass v2.x database - AES/Rijndael only. It uses the new database version 2.x, but you can't use TwoFish encryption, and it removes some display features like the preview panel (the bottom/right panel with details on the selected entry) and customizing columns. Viewing/editing an entry does not open a new window, it changes the whole KeePassX window into the view/edit window. For some reason, it wouldn't let me resize the window to any smaller than this screenshot. Hopefully they'll add back the missing display features soon, but until then I'll stick with KeePassX 0.4.x. A "new contender" has emerged, KeePassXC, that describes itself as "a community fork of KeePassX, a native cross-platform port of KeePass Password Safe, with the goal to extend and improve it with new features and bugfixes to provide a feature-rich, fully cross-platform and modern open-source password manager." Q: Why KeePassXC instead of KeePassX? A: KeePassX is an amazing password manager, but hasn't seen much active development for quite a while. Many good pull requests were never merged and the original project is missing some features which users can expect from a modern password manager. Hence, we decided to fork KeePassX to continue its development and provide you with everything you love about KeePassX plus many new features and bugfixes. 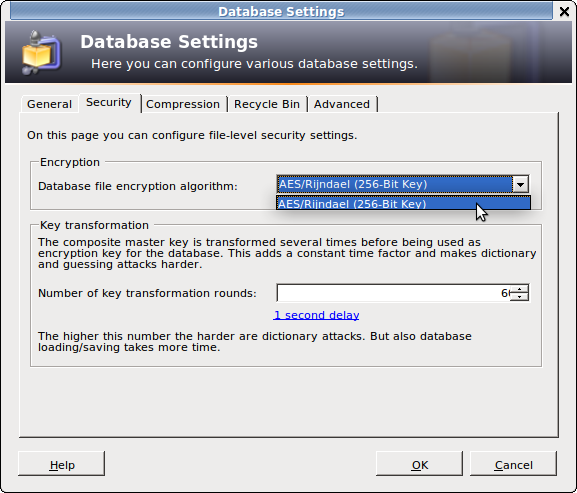 Q: Why KeePassXC instead of KeePass? A: KeePass is a very proven and feature-rich password manager and there is nothing fundamentally wrong with it. However, it is written in C# and therefore requires Microsoft's .NET platform. On systems other than Windows, you can run KeePass using the Mono runtime libraries, but you won't get the native look and feel which you are used to. KeePassXC, on the other hand, is developed in C++ and runs natively on all platforms giving you the best-possible platform integration. Note: "As of KeePassXC 2.3, we deprecated KeePassHTTP in favor of KeePassXC-Browser"
And the page "KeePass Edition Comparison" is probably helpful to differentiate versions 1 and 2. Full Unicode Support, Enhanced High DPI Support, Windows User Account, One-Time Passwords (as a plugin), Enter Master Key on Secure Desktop, Custom String Fields, Internal Attachment Viewer/Editor, Entry History, Import External Icons, Group Notes, Show Entries of Sub-Groups, Recycle Bin, Entry Tags, Grouped Results, Sort Search Results, Auto-Type TCATO, Pick Characters, Export To XSL-Transformed, Import from "More than 35 formats (see Help: Import)", Open Database via URL (FTP, HTTP, WebDAV, SCP, SFTP, FTPS), Shared Database Editing (Office-style locking), Synchronization, Scripting, Trigger System. And, KeePass 1.x supports the AES/Rijndael & Twofish Encryption Algorithms. KeePass 2.x supports AES/Rijndael in KeePassX, AES & TwoFish for KeePassXC, AES & ChaCha20 for KeePass. See the linked Comparison page above for more info, & some description. Are there any plugins for KeePassX? There is no interface build in to support plugins. Therefore, no plugins available. 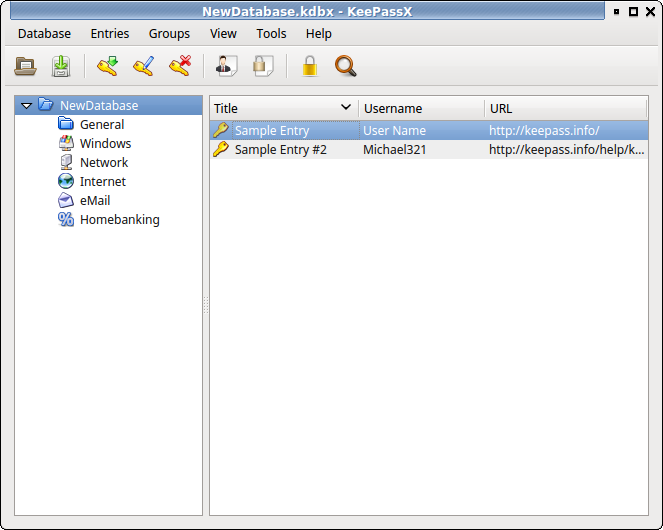 KeePassX is an open-source clone of KeePass for Linux and OS X. As KeePassX uses QT, they don't have the same user interface. However, they can be used interchangeably as their .kdb or .kdbx databases are binary-compatible. So, until they develop such features in KeepassX 2.x I suggest you to use Keepass2. Not the answer you're looking for? Browse other questions tagged keepass keepassx or ask your own question. Mac and Windows alternative to KeePass? What is the easiest way to copy Chrome's login/passses into KeePass without creating duplicates? How to use passifox with keepassX ? Is it possible to add a pause/delay between keystrokes when using KeePassX?